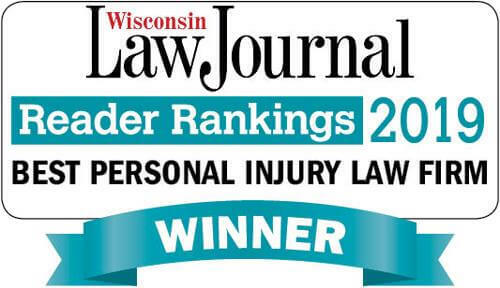 Rated Best Personal Injury Law Firm by Wisconsin Law Journal | Hupy and Abraham, S.C.
Hupy and Abraham, S.C. is pleased to announce that it has been named Best Personal Injury Law Firm by the Wisconsin Law Journal in the 2019 Reader Rankings poll. The Wisconsin Law Journal is the state’s leading legal newspaper and resource for judges, attorneys and administrative staff. “Reader Rankings” respondents consisted of other organizations and members within the legal community. Hupy and Abraham has won “Best Personal Injury Law Firm” every year since its inaugural poll in 2017. To date, Hupy and Abraham has been recognized with over 250 awards. The firm has won a number of publicly voted polls, including the Milwaukee A-List, the Milwaukee Journal Sentinel “Top Choice” poll and the Shepherd Express “Best of Milwaukee” poll. Additionally, the firm has received the grade of AV Preeminent – for ethical standards and legal ability – by Martindale-Hubbell. Several attorneys have received recognition by other legal entities, which include the Super Lawyers and Rising Stars’ lists, the Multi-Million Dollar Advocates Forum and maintaining a 10.0 rating on AVVO.com. For nearly 50 years, Hupy and Abraham has strived to provide a high level of service and results for each client it works with. The firm has obtained over a billion dollars in verdicts and settlements and has maintained its professionalism and reputation.